Here’s my picks for what’s coming out from DC Comics for August 2018. A full list of solicitations is available here. DC’s announced that “Detective Comics” will go to a bimonthly (i.e., twice a month) publication starting this month. The blog Comichron speculates it’s to get the title the company’s named after up to its 1000th issue sometime next spring (and in time for Batman’s 80th anniversary). DC also apparently canceled the “Super Sons” book to replace it with… a 12-issue miniseries? Meanwhile, a new line of comics based on Neil Gaiman’s “The Sandman” kicks off this month, with the release of “The Sandman Universe” #1. 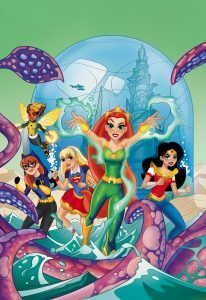 Out in September (but solicited early) is a new “DC Super Hero Girls” graphic novel. This one revolves around Mera and Atlantis. The premise of that series was Penelope, the heiress to the Pitstop fortune, was constantly threatened (and placed in ludicrous death traps) by the villainous Hooded Claw (voiced by actor Paul Lynde). Unknown to everyone, the Claw’s secretly Penelope’s guardian, Sylvester Sneekly. Penelope would often be rescued by (and often end up rescuing in turn) the 1920s-style mobsters, the Ant Hill Mob (who still drove their Roaring 20s-era limousine from the previous series). As far as I can determine, Penelope’s the first female character to headline a half-hour American animated series. 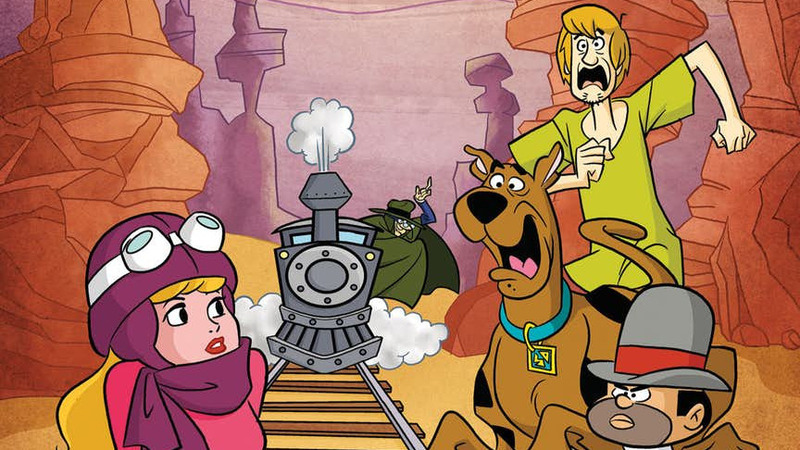 Finally, I wonder where the “vanilla” “Scooby-Doo” comic’s gone, as it wasn’t solicited for July or August. Is it canceled? Just late? Or I missed it? Yes, it’s the villains meeting the characters this time, and (unsurprisingly) only one non-Batman-related villain involved. The art in the issues’ lead stories, as usual, tries to fit the Looney Tunes into the DCU’s setting. Vixen to get an online CW animated series, ties into "Flash" / "Arrow"